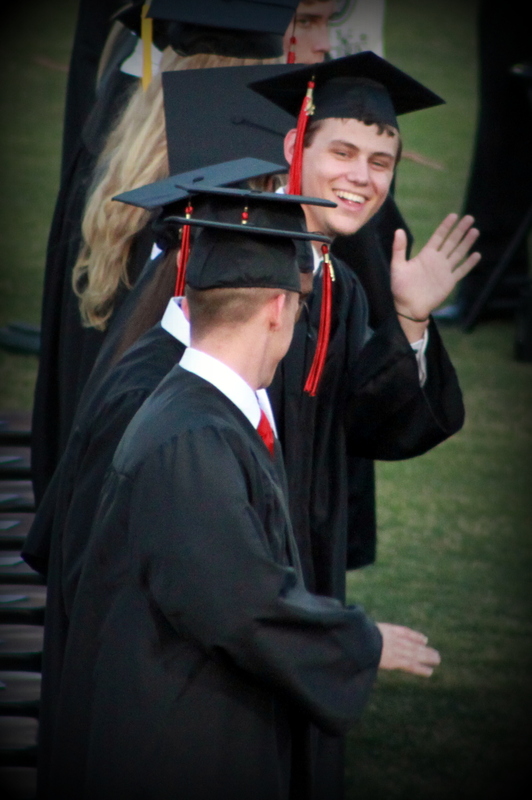 Hunter Allen Black, Class of 2012….that’s my nephew. I felt such a sense of pride in that boy tonight. Not that I hadn’t felt the same pride when my own children graduated, or when his older brother and sister graduated. It was just knowing that this was the final high school graduate to come from my immediate family. It was recognizing what a fine young man Hunter has been and is…what a remarkable man he will be. Lots of people celebrate graduations every year. There are Preschool, Kindergarten, High School, College, and Graduate School graduations. People graduate with degrees from medical school and law school and many other schools. So, what exactly is graduation–why do we celebrate it like we do? Graduation signifies the attainment of some academic accomplishment/completion. It is also known as a commencement, and that makes me think of beginnings. So, these graduates are beginning…a new stage of life. When they commence, they’ll have in their hands a piece of paper that symbolizes 13 years of school. So, to all of the graduates this year, I commend you on sticking with it long enough to finish. Graduating means moving up a level…you’re moving up to a new level. Maybe you will go to work or maybe you’ll go to school some more. Either way, this part of life has come to a close, and there is a wonderful exciting menu lying open. Choose a dish that won’t cause heartburn. Choose a dish that will leave you wanting more. Where you’ve been….that’s the appetizer. Where you’re going, that’s the main dish. Dessert? I think that’s the treat that awaits when you retire. Eat well, my friends! So well written, Susan. It was wonderful being there to share this special time with our family. Thank you, Lee Ann and David, for continuing to encourage and love your children.